When William Hartnell became Patrick Troughton, it wasn’t just his face that changed – his costume miraculously regenerated at the same time. For Sylvester’s costume transition scene he goes through a number of outfit changes. 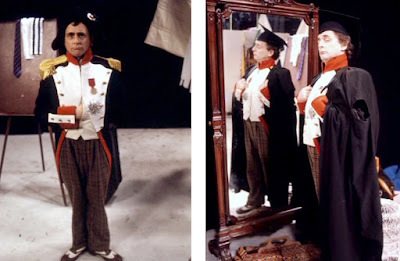 In a throw-back to Tom Baker’s transition, The Doctor first tries a couple of totally unsuitable costumes: firstly a Nepoleonic uniform (see below, left); then a university cloak and mortar board hat (see below, right). 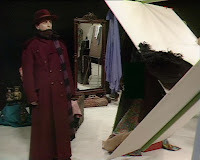 We are then treated to a fan-pleasing recap of four Doctor’s costumes: firstly Tom Baker’s season 18 plum great-coat and fedora, though with an incorrect scarf (see right). Then something special from the archives: Jon Pertwee’s original rust red velvet smoking jacket as seen in The Curse of Peladon, The Time Monster, The Three Doctors and briefly in Planet of the Spiders (see left). 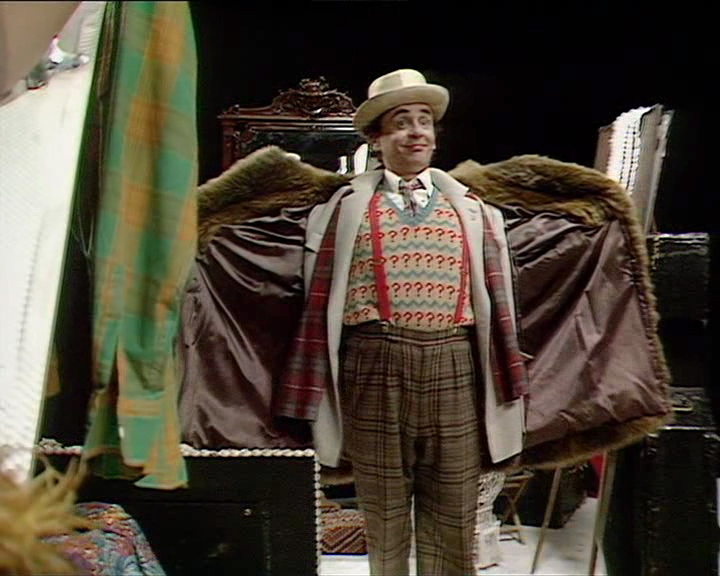 He then tries Peter Davison’s season 21 outfit. 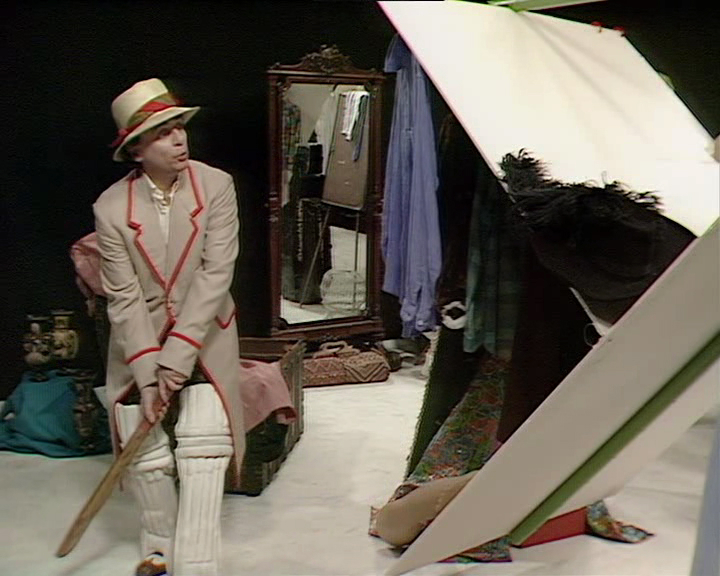 Of interest here is that he is wear a panama hat (probably just from his finalised costume, but with th brim turned down) with the paisley hanky that will form part of his own costume (see right). 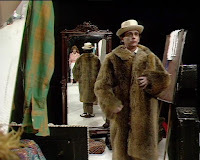 Finally, he emerges wearing the big fur coat worn by Patrick Troughton in The Five Doctors. 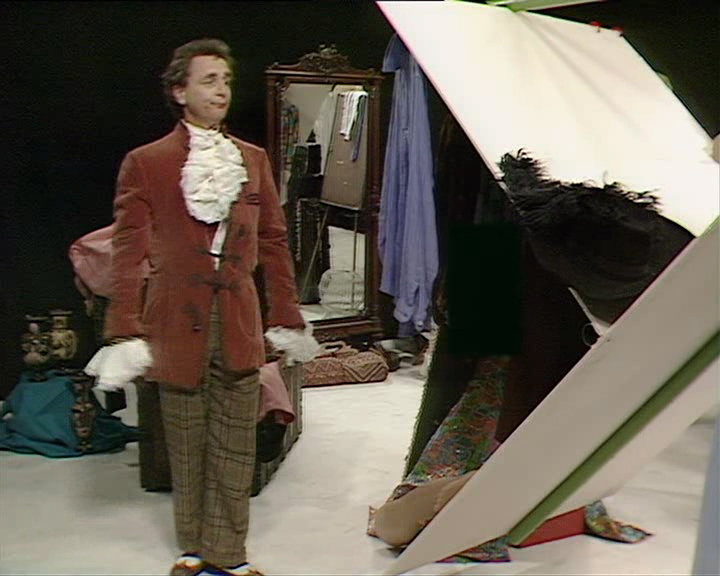 This later popped up again during Colin Baker’s costume transition scene. This is then shed to make the ‘big reveal’ for the Seventh Doctor’s final costume. Notice that the red braces are worn over the top of the question-mark pullover. 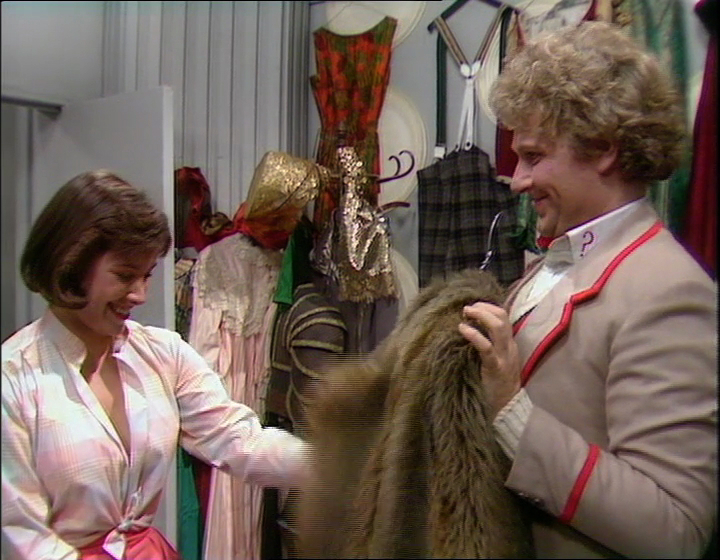 This is the only story where they are worn like this. 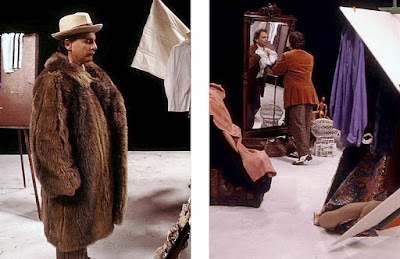 Lastly, here are some photos I have found taken during the filming of this scene. Great article and some super screen pics! I actually own that purple striped scarf (plus an off-cut of it) as seen on-screen during his costume changes. 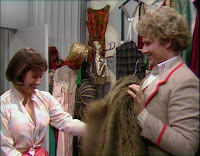 Sadly, it's my only bit of actual real costume/prop history I own from the series but I'm proud I own it none the less. Does it seem a little short? 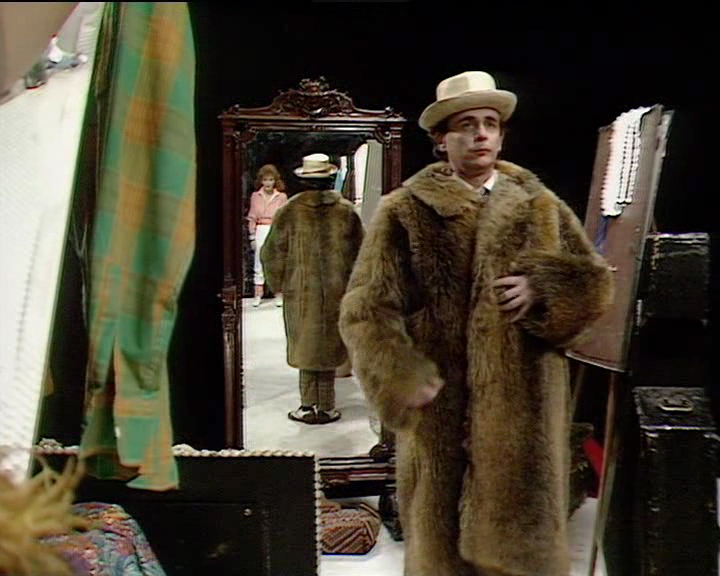 It's just that I own the rest of it! !